The Start of a New SEAsia Adventure! 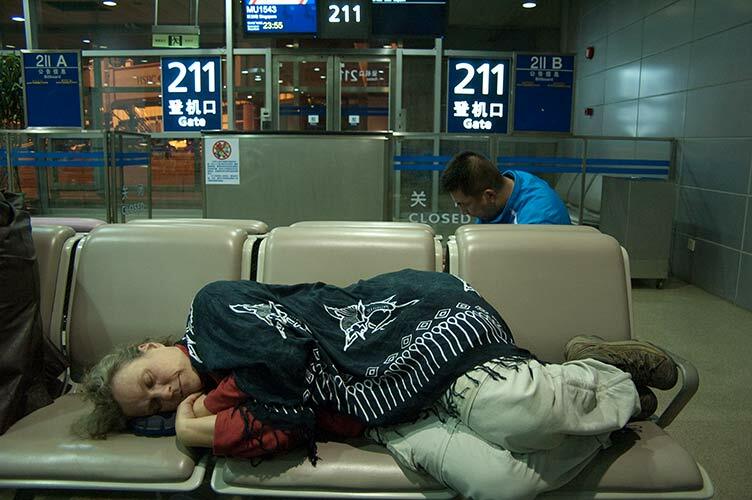 It all starts with an exhausting 20 hour flight, including a 4 hour layover in Shanghai where we did manage to doze a bit. The only excitement was seeing the fellow across the aisle from me get hauled off at Shanghai. Probably for drugs judging from his rather bizarre behaviour. Our first Bangkok hotel, The Silver Gold, was close to the airport. The room was basic but comfy. The airport (and therefore LRT) shuttle was impressive. The desk staff were jaded and somewhat less than helpful though. But we did get a good night’s sleep. 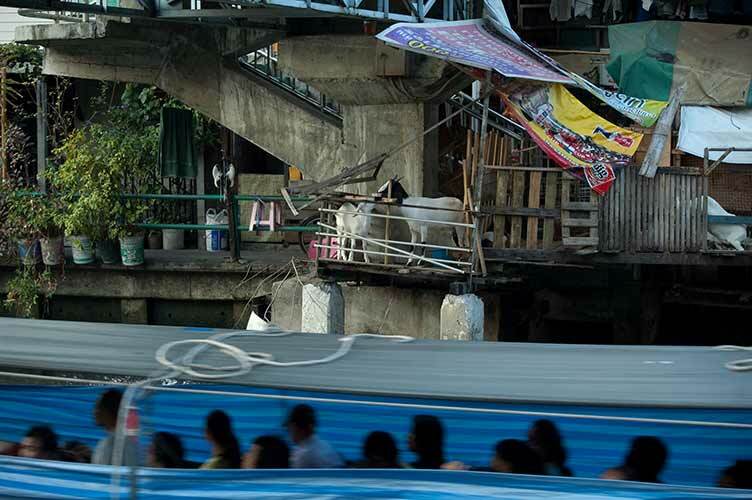 The amazing Bangkok transport system, featuring the LRT, made it easy to zip into town. First we enjoyed reasonably priced refreshments in a combo cafe/computer shop. The hanging shades (below) house little speakers for individual sound at each table. We only tried the coffee, Thai tea and a WiFi connection. 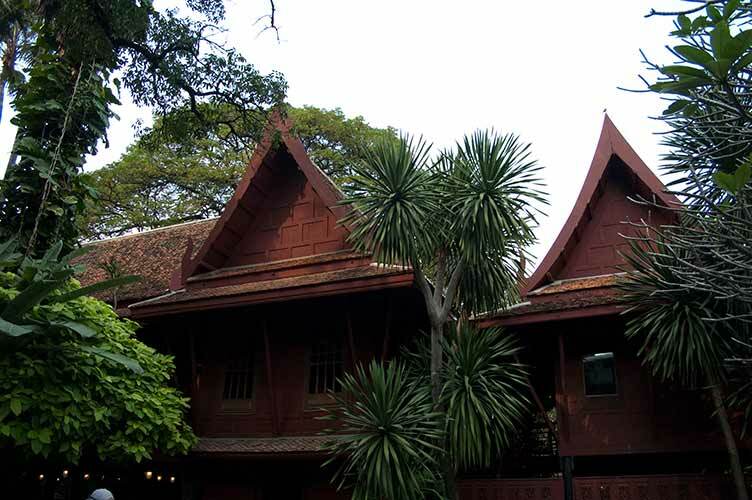 After exploring a huge modern mall and getting our bearings we walked to the Jim Thompson House where we joined a guided tour of the expat American’s intriguing home. It is built from many smaller houses, disassembled and then joined together. He disappeared in Malaysia in the ’60s, leaving the house and art collection to a nephew who donated it to the Thai state. Now the tours, cafe and gift shop proceeds all go to local charities. 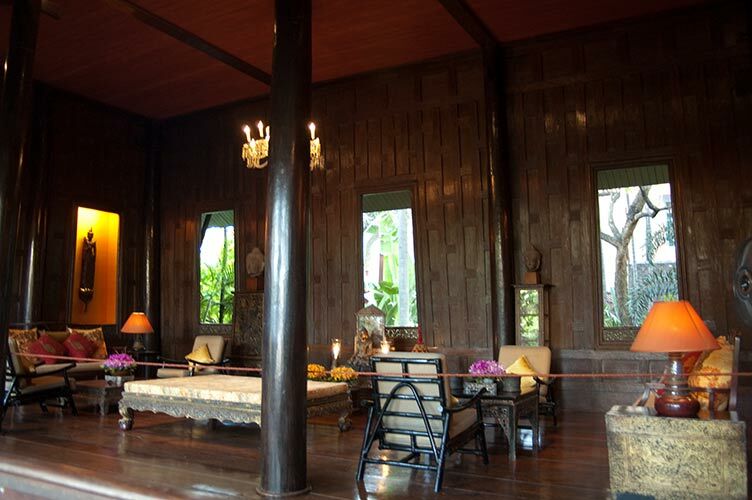 Note the trapazoidal shapes, a result of no nails being used in the traditional Thai construction. Most of the wood is teak. 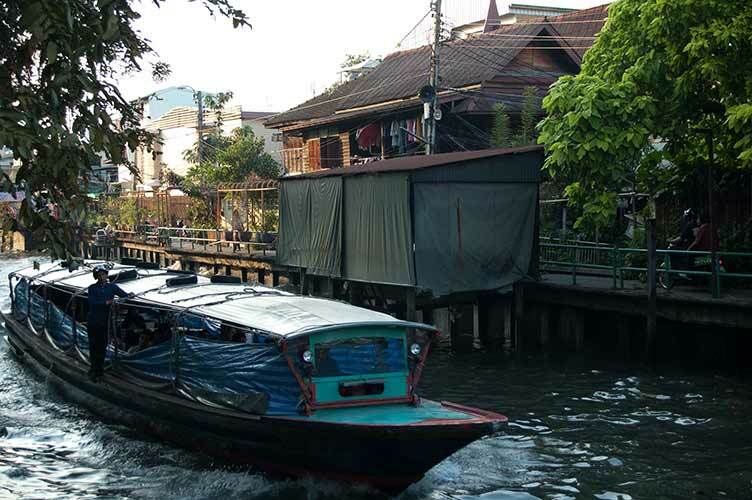 The house is beside one of Bangkok’s canals. We walked along the canal, enjoying the quiet, the passing boats and the sights. 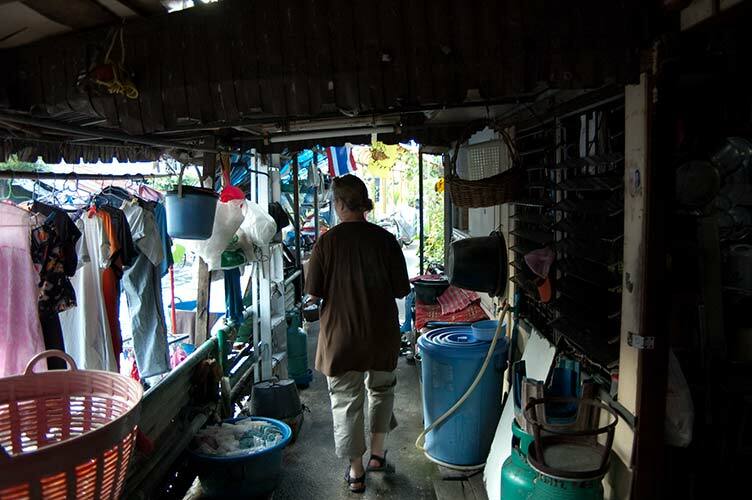 Here we found a quiet corner of an older Bangkok. We walked past wee homes and shops. Including a couple of goats on a platform over the canal. 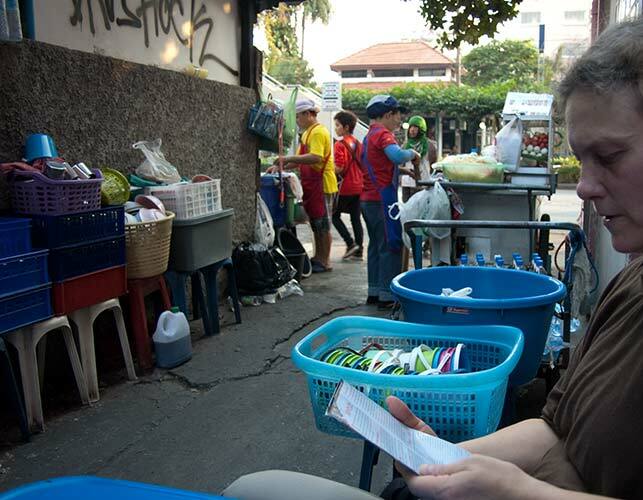 After leaving the canal we found one of the ubiquitous street food stalls in an alley off a busy street. We first stopped for a cold beer but after sitting awhile and enjoying the ambience (and noting how busy they were and how much good looking food was going by) we decided to eat. It was all we hoped for: papaya salad, hot and spicy prawns…. we’d arrived…. After our meal we wandered back to our starting point, passing the Arts and Cultural Centre on the way. By the entrance a bit of street art caught my eye. 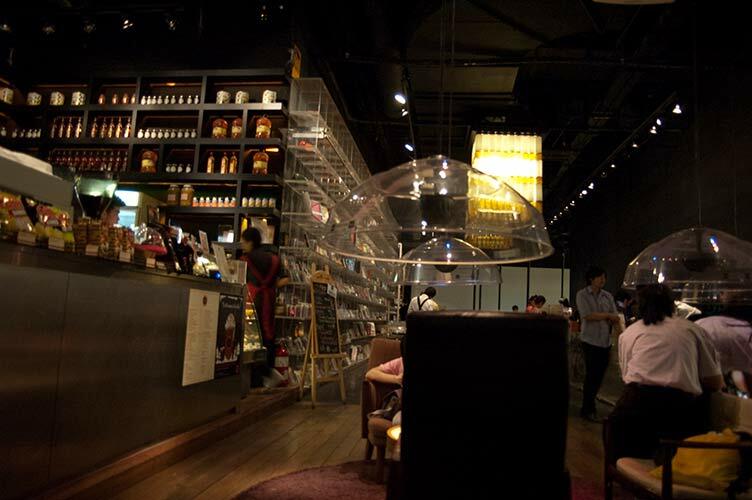 Thailand, and Bangkok especially, has a reputation of being a SEAsian arts centre. 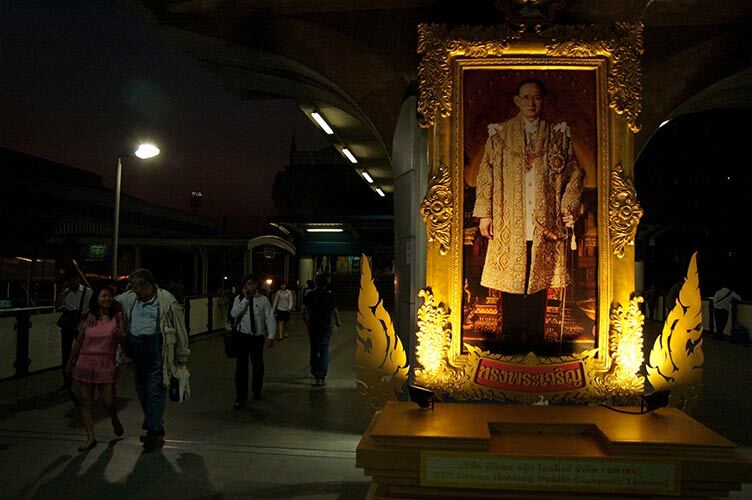 Back at the train station we saw one of the ubiquitous portraits of the king, glowing in the twilight. We caught the train and LRT back to what we thought would be a stop we could walk back to our hotel. But upon leaving the station we were approached by a Thai woman who told us it would be too far to walk and that no taxis stopped there. We were joined by a Thai gentleman and between the two of them they tracked down the location of our hotel and gave it a call. We were advised to get back on the LRT and go to the airport where the shuttle would take us back to our hotel. 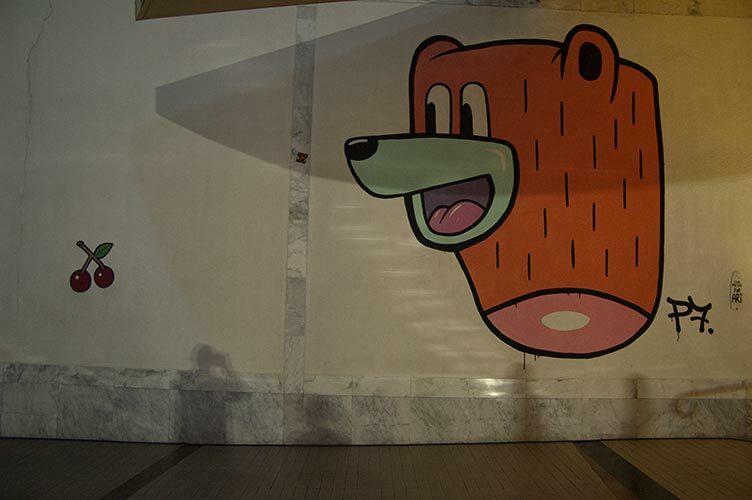 Once again we were impressed how even in a huge city like Bangkok the Thai people are so friendly and helpful. 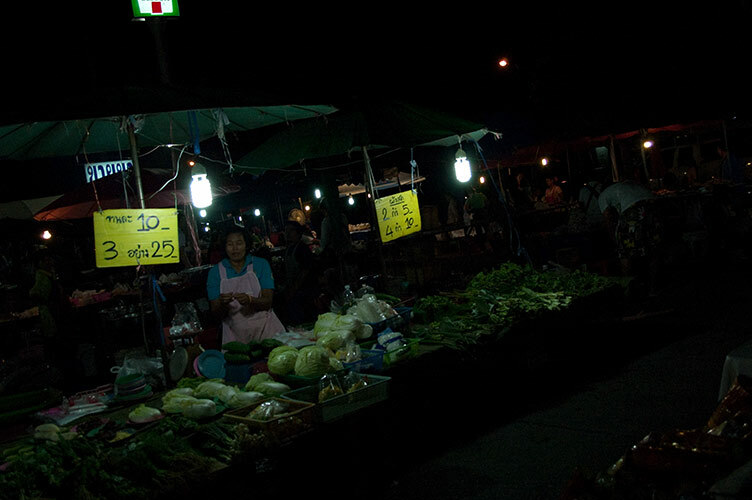 Upon returning to our hotel we noticed a street market was set up so after dumping our stuff we returned outside for a quick perusal of the night market. In amongst the food and goods stalls a lone Thai man danced on a small stage to blasting disco. Strange and surreal but all part of the fascination. btw: if these posts seem disjointed and/or odd it may be me getting used to Sue’s wee eMachine or it may be me trying to get as much done as possible before the free WiFi time runs out! And once we’re in Burma we’ll likely have no internet connection for that month or so. But we will try and keep posting photos and a few words about our two month journey. |Please check back for posts once in a while, and comments are appreciated! Cheers! Glad to see you’re safe and sound, and enjoying the cold beer and good food of Bangkok!! well guys, I ALMOST feel as if I’m with you! Hope you can post from Burma. Kell – enjoyed your first post. While voyeuristic, still a great way to get a sense of and your take on the country.